– €39 starting from Torino Lingotto (plus baggage supplements and extra fee for night or holiday travel). If the amount on the taximeter is less than €34 or €39 you’ll pay the amount of the taximeter. WeTaxi is the app available for iOS and Android, it has more than 1400 licensed taxi drivers. With this app you can also make an environmentally friendly choice, by sharing your trip with users who are doing similar routes. GTT – Gruppo Torinese Trasporti is the local public transport company. They offer city buses, tramway buses, city trains, vintage trams, and also the underground transport. Green Line T: 800 019152; from mobile (Toll Number): T: 011 0672000. Railway Station Torino Porta Nuova, in front of the track 20. Mon-Fri 7.15am-7pm. Sat, Sun and holidays 9am-5pm. Lost and Found on GTT vehicles: Via Meucci 4. Mon, Wed, Thurs, 9am-12am. T: 011 4430753. Ordinary ticket (€1.70) valid for 100 minutes on buses, trams or metro. They also offer the dining on a tram experience (Gustotram and Ristocolor). The ‘metropolitana’, a fully automated subway system, extends for 13.2km and only includes one line that connects the commune of Collegno to the Torino Porta Nuova railway station (the city’s main railway hub) and the Torino Porta Susa station, before reaching the Lingotto Fiere terminus. The regular ticket is 1.70 euro and you can use it on buses and tram lines for 100 minutes after you stamp itduring your first ride. Beware: you can use it only for 1 underground ride. At the time we write, you can also buy a daily ticket for 4 euro, or 7 daily tickets for 17.50 euro. 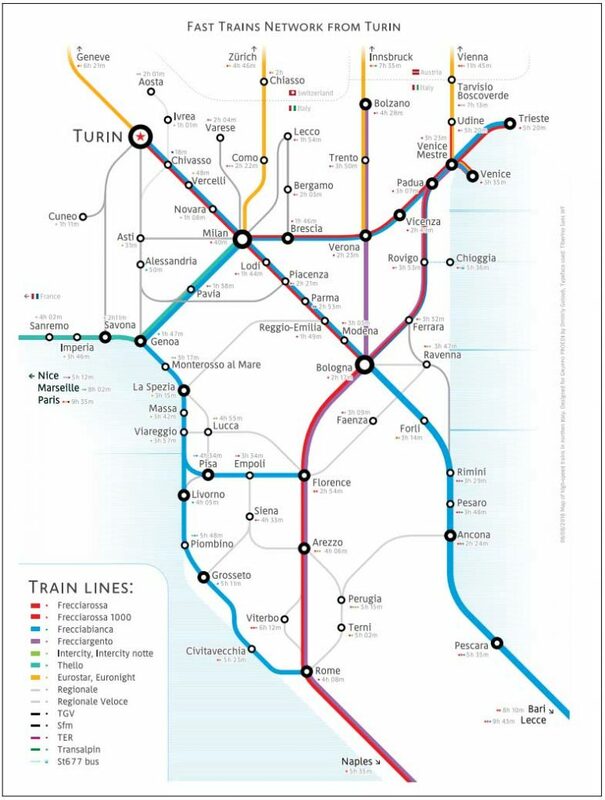 Regional, interregional, high-speed and international trains arrive at and depart from the Porta Nuova station. If you drive in Turin, beware of access regulation ‘ZTL Centrale’, which is active Mon-Fri, 7.30am-10.30am and prohibits the circulation of private vehicles and parking in the centre of the city. This restriction does not, however, apply to taxis or chauffer-driven hired cars. Visitors traveling by their own car and staying in a hotel in the central area can enter the ZTL for the day of arrival and departure only, filling out a form at the hotel reception (ask your concierge for more information). In the same way, it is possible to reach paid public parking areas within the ZTL by filling in the same parking lot with the request for transit authorization no later than 11am. Blue – you don’t have to pay if you’re driving a bike. If you’re driving a car, the park is free only after midnight. Depending on how central the parking is, fees are: 1 euro per hour, 1.30 euro per hour, 1.50 euro per hour or 2.50 euro per hour. In less central areas you only have to pay from Monday to Saturday, from 8am to 7.30pm or from 7am to 11pm. You can pay it at any of the Sisal bars in town (they show a Sisal logo).